World traveler Dylan Bostic returns to the show in advance of International Wrestling Cartel’s Winner Take All event. We discuss his traveling ways with Championship Wrestling from Hollywood in Los Angeles, North Shore Pro Wrestling in Montreal, his travel woes doing BOTH in a weekend with WestJet, the medical condition that has kept him from competing in WWE, his appearance on WWE Smackdown against Ryback, and what he’s done since. How is WWE NXT holding up after the End…of the Beginning? We talk Finn Balor, Shinsuke Nakamura, Bayley and more! Big Question: Who do you want to win the WWE Cruiserweight Classic? WWE’s New Era is in full swing after WWE Payback. But is this much different than WWF of 1995 with Mabel? The TNA Arrival in WWE NXT is happening! Eric Young makes the latest impact. What could it mean for the future of both promotions? Ryback has a problem with equal pay in WWE. But will his protest yield results? Could Camp WWE usher in a new era of adult content on WWE Network? Thanks to our Awesome Patreons Bodiggity (@ajfrompgh), Antonio Garza (@TheWRevolution), Alex Kahrs (@power2thesmarks) ,Ed Burke (@EdBurke37), and The Matthew and Jennifer Carlins Foundation for Podcast Betterment (@MainstreamMat and @JenCarlins)! You can support the show too at Patreon.com/wrestlingmayhemshow ! What’s At Stake – WWE World Heavyweight Championship. Roman Reigns’ position as the next face of WWE. I know I’ve asked this before, but it’s worth repeating. Are we doing this, or not? Is Roman Reigns really the man to lead WWE into the future, or is he an unworthy pretender to the throne? A year ago, Reigns was the face of the company in waiting. His crowning moment at WrestleMania 31 seemed to be a foregone conclusion, but then Brock Lesnar signed a new contract with WWE and Seth Rollins swooped in with the mother of all Money In The Bank cash-ins and Reigns’ big night was suddenly on hold. Fast-forward to this weekend, and Roman Reigns is a two-time WWE World Heavyweight Championship. He’s back in the WrestleMania main event with a chance to win the title for a third time against a slightly less formidable opponent than Brock Lesnar, but not much else has changed. No matter what Roman Reigns does Sunday, it probably won’t be enough for a lot of fans in attendance at AT&T Stadium. The booing of Reigns is strange, because most fans will admit privately they don’t have much a problem with the man himself. It’s what he represents, and the sense that his place on the card is undeserved. For his part, Reigns hasn’t done much to curry favor for himself. In at least one recent interview, he sounded to some fans like a guy who’s oblivious to the reasons many haven’t taken to him. If Reigns doesn’t understand why he’s being booed, how is WWE ever going to be able to turn public opinion in his favor? There’s still a lot of uncertainty surrounding Roman Reigns, which makes you wonder if he’s the right choice to be the face of the company. Maybe that heel turn isn’t such a bad idea after all? What’s At Stake -Undertaker’s career at WrestleMania. Shane McMahon’s future in WWE. Control of Monday Night Raw. Shane’s lock box of McMahon family secrets. Vince McMahon’s on-air presence on WWE television. The future of The Authority. Have the stakes ever been greater or more numerous for a WrestleMania match? Shane McMahon roared back onto WWE television like a knight in shining armor, and soon after that, found himself set to face The Undertaker inside Hell In A Cell at WrestleMania. Seemingly everything is on the line. Vince McMahon stated that if The Undertaker loses it will be his last match at WrestleMania. If Shane McMahon loses, who knows how long it could be before we see him again? If Shane wins, everything changes. He takes control of Monday Night Raw, and has publicly promised to fire The Authority and send Vince McMahon into exile. And what about that lock box? Shane mentioned it during his first night back on Raw, but it hasn’t been mentioned since. I’d assumed WWE had decided to forget about it too, but it’s still mentioned in a poll on the WWE website. Is there another layer to this story that has yet to be revealed? As for the match itself, I expect a huge spectacle. It’s the son of the owner of the company vs. its most treasured and revered superstar. You can bet everything is on the table to make this match unforgettable. What’s At Stake – Dean Ambrose’s best shot at superstardom. Dean Ambrose is on the roll of his career in WWE. He put on a great match against Kevin Owens at Royal Rumble. Then, followed that with a strong showing in the Rumble match itself, where he was the last man eliminated by Triple H. His promos ahead of the main event title match against Triple H at Roadblock were so good, there were a lot of people who believed he could pull off the upset and throw the top of the WrestleMania card into chaos. At some point over the past few months, the people in charge at WWE took notice. Rumors of a WrestleMania encounter between Brock Lesnar and Bray Wyatt evaporated. 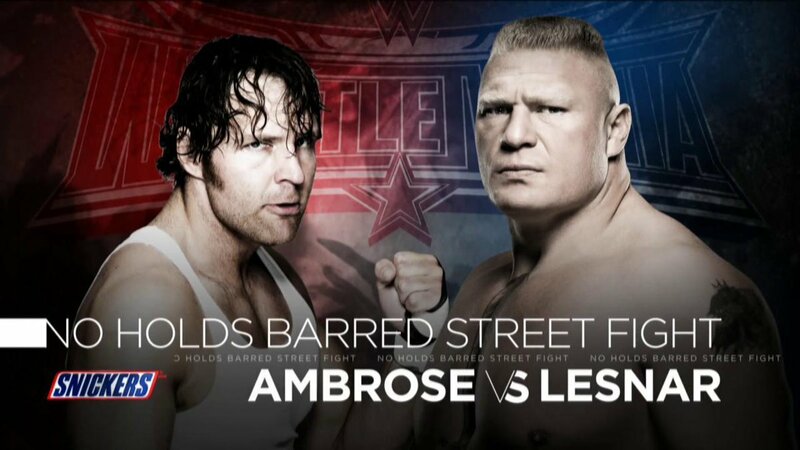 Instead, we’re getting this No Holds Barred Street Fight between Lesnar and Ambrose. I think it’s best for everyone. Lesnar has brutalized Ambrose at every turn leading up to this match, but Dean remains undeterred. These two will have almost every “toy” and tool at their disposal Sunday night, and I can’t help but wonder how far Ambrose is willing to go to get his revenge for all those beatings he’s taken from The Beast. Somebody better put Lucha Underground’s Nunchuck Club on notice. Brock Lesnar has lost exactly one singles match in WWE over the past two years. Lesnar’s last loss in a singles match at WrestleMania was against Triple H at WrestleMania 29. Coincidentally, that was also a No Holds Barred Match. WWE has gone to great lengths over the past couple years to protect the aura of Brock Lesnar. If Ambrose wins Sunday, it will be a huge accomplishment and it would elevate his stardom to new heights. What’s At Stake – WWE Divas Championship. A chance to ignite the true Divas Revolution. A year ago, Vince McMahon attended his first NXT live event in San Jose during WrestleMania weekend. One of the matches that night was Charlotte vs. Sasha Banks. By most accounts, they stole the show that night. The event was a huge success for NXT – a seminal moment in the brand’s history. I imagine Vince McMahon decided on the spot that Banks and Charlotte would face off again a year later. 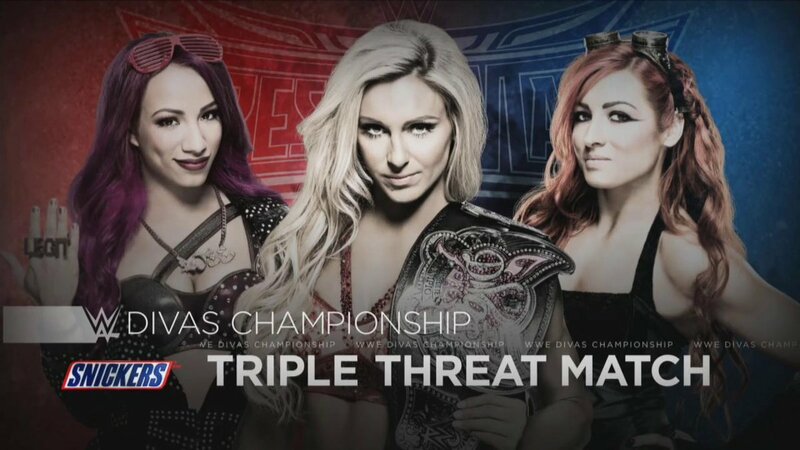 Only this time, it would be on the biggest stage of their careers at WrestleMania. Somewhere along the way, Becky Lynch earned herself a place in what could be the moment longtime fans of NXT’s women’s division have been waiting for. These three have delivered in big matches before, but the stage (and the stakes) have never been this high. Can they deliver? If they do, the Divas Revolution we were promised may finally become reality. What’s At Stake – A.J. Styles’ path to the top of WWE. Leaving TNA was the best A.J. Styles ever made. Not long after he left Dixieland, Styles was headlining events for Ring Of Honor, New Japan and countless independent promotions. Today, he is arguably the best pro wrestler on the planet. That’s certainly why WWE was interested in him. Styles’ debut was perhaps the biggest moment during last January’s Royal Rumble match. The moment he stepped through the curtain in Orlando, Florida, he was one of the biggest stars in WWE, but instead of contending for the world title, he finds himself in a prolonged storyline with Chris Jericho. The end result should be a really good match at WrestleMania, but Styles (and frankly, Jericho too) is capable of so much more. Hopefully, this is a first step toward even bigger things. What’s At Stake – WWE Intercontinental Championship. The unique destinies of so many men are tied to this match. Kevin Owens is out to steal the show he’s dubbed #KOMania, but Sami Zayn has already stolen one show this weekend. Zayn is coming off one of the great matches in NXT history Friday night. He and Shinsuke Nakamura blew the roof off of NXT TakeOver: Dallas in what could be the signature match of WrestleMania weekend. It was bittersweet knowing it may be the last time we see Sami Zayn in an NXT ring, especially because he’s yet to be fully embraced by the WWE Universe. 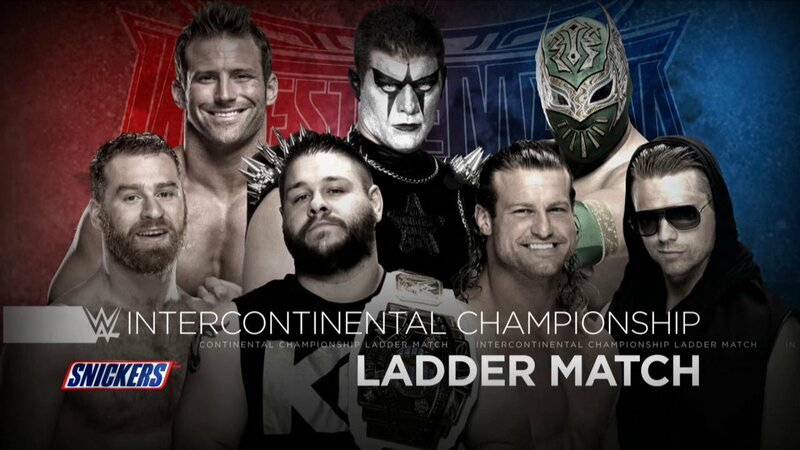 The rest of the men in Sunday’s ladder match are a mixed bag. Dolph Ziggler has waited too long for his first singles match at WrestleMania, and it’s a shame he won’t get it this year. The Miz will remind you at every turn that he was once in the main event of WrestleMania. Stardust, Sin Cara and Zack Ryder all bring something to this match. This could exceed a lot of people’s expectations. What’s At Stake – The cheers and adulation of the WWE Universe. 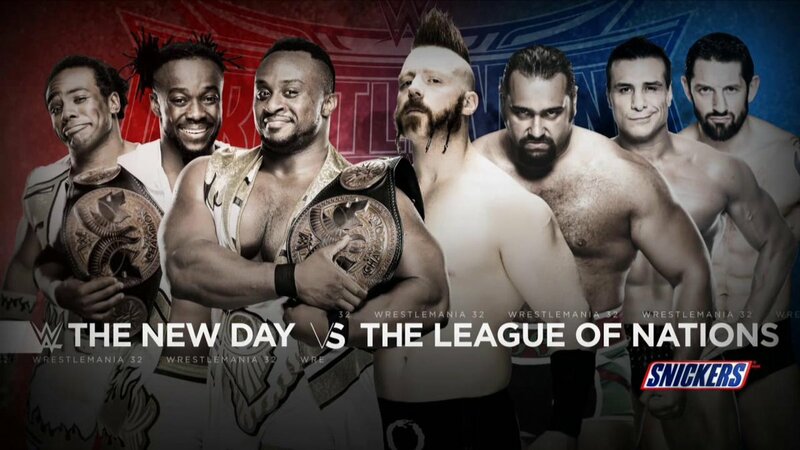 One of the hottest acts in WWE is stuck in a match where their W…W…E World Tag Team Championships aren’t even on the line, but there is something to be gained here. The current kings of moving merchandise in WWE are looking for cheers, and this match will likely solidify them as a team fans can get behind. What’s At Stake – A big trophy. The tradition returns for the third straight WrestleMania, but look at that list of participants. Do you see an obvious winner? Makes you wonder if we could a surprise entrant and winner. What’s At Stake – Fresh momentum toward a tag team title shot. I was really enjoying the interaction between these two teams, but it has cooled a bit in recent weeks. Still, I’d expect them to put on a solid match, and it will be cool to see the Dudley Boyz back on the big stage at WrestleMania. What’s At Stake – A chance to shut up the doubters. 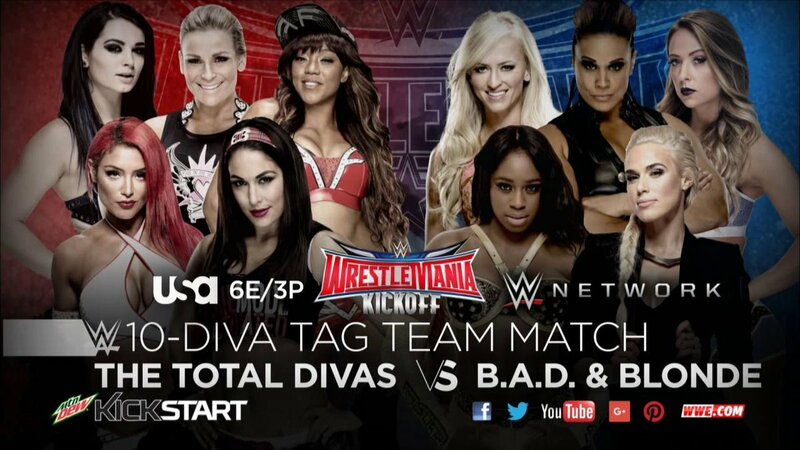 10 Divas are thrown together into this hastily built tag team match. It’ll be Lana’s first appearance as an in-ring performer. It will be Eva Marie’s return to main roster action after some time in NXT. It will also be a big return for Emma, who reinvented herself in NXT. A lot of fans are hating on this match, but there’s a lot of talent involved. A year ago, the U.S. 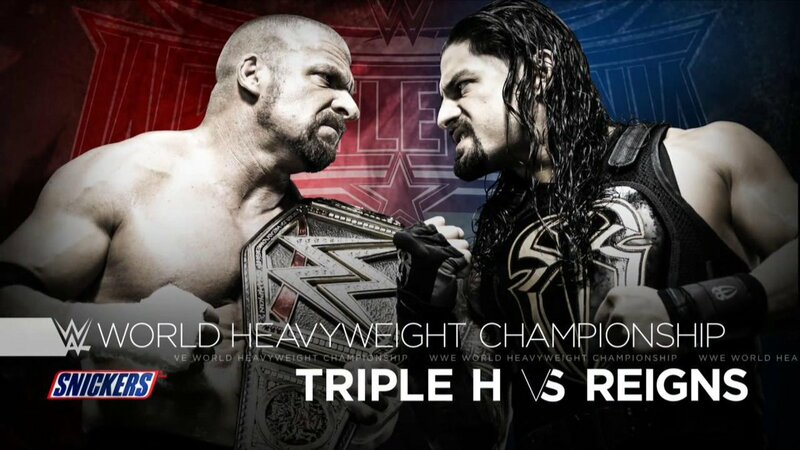 Title was on the line in one of the biggest matches of WrestleMania 31. Kalisto and Ryback have a challenge on their hands, but the story of the fighting, undersized champion against the big, musclebound bully should be effective. It just hope the fans are let inside the stadium before this match happens. Being a WWE fan isn’t always easy. It’s hard to resist the urge to complain about things we don’t like. Just remember, Sunday is our day. Revel in your fandom and your passion for professional wrestling. Embrace those around you who love it too. Enjoy WrestleMania, and everything that’s surrounding it this weekend. There’s no better time to be a fan. WWE RAW Wrap Up 3/7/16: Mean Street Posse – Where are They Now? Mad Mike and Sorgatron discuss WWE RAW including Shane McMahon getting punchy with some security guards, wanting to know: Mean Street Posse – Where are they now? Y2AJ Implodes! What will get get from another AJ Styles vs Chris Jericho? Implications for WWE Roadblock and WrestleMania, and we implement a new rating system! Tell us: How many hours of RAW were watchable for you this week? Talking WWE RAW with Mad Mike (@madmike4883), Rizz (@rizzplaysgames) Bobby (@bobbyfjtown), and Sorg (@sorgatron). Shane McMahon is BACK! We had to clean up messes. Taking on Undertaker is so great it could have been Kayfabenews.com story. The Social Outcasts take on the super hero team up of AJ Styles and Chris Jericho, Vince McMahon jams FLOrida and Limp Bizkit on his Harley Motorcycle, The Wyatts are dead to Mad Mike as Ryback walks away, just like the fans during that match, Roman Reigns gets slammed by the crowd and Triple H as we unveil the Damian Sandow factor.